Freebeard mentioned plasma actuators in another thread. I recalled reading about the effect some time ago. Searching on the web for more info, I came across this. Our patented technology (s) uses an active flow control system utilizing plasma actuators has been developed at the University of Notre Dame. This system is capable of generating a body force which controls flow separation from a vehicle. 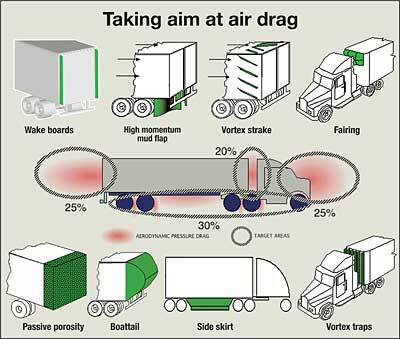 By controlling flow separation, the drag force on a vehicle is minimized. In essence, a vehicle can be streamlined independent of its actual shape. Physical devices such as spoilers, bobtails, flow plates, and diverter tabs have been used to move the airflow in a desired direction. Plasma actuators ionize the local airflow to induce a similar affect without the added structural components or weight. Even the best designed physical devices attempt to divert flow, unlike plasmas which modify the existing flow field. There are good videos in the link showing the effect. Using plasma actuators to reduce drag in the future looks to be not only possible. I found an article in Popular Science last November (http://ecomodder.com/forum/showthrea...rag-20309.html) but the mention seems to have killed that thread. The progression as I have followed it was the Brown-Biefeld effect in UFO literature to the ionized exhaust gasses of the B-2 bomber to, apparently, 18-wheelers on the freeway any day now. It's a crazy world. The graphic in the link suposses a 15% reduction at the back of a truck box. Seems like it should be more. I wonder how much energy it takes to produce the plasma? It take a high voltage, high frequency signal to open the plasma channel, but I think it takes less to maintain it. Could be wrong. Power needed is very low. Our preliminary testing shows an average power consumption of 1 watt for 1 meter long actuator . That is a very low power requirement. It's always nice to have a representative or in this case "co founder" of the company to answer questions. Any idea when it will be available...??? Preliminary on-truck testing is planned for August and planning to have a product for aft portion of the trailer (eTail) by early 2017. As August is winding down, I wonder how the testing went. Deflector shield on full; engage warp drive?